A scene once familiar to many! Just rediscovered these photos of a painting of Princess Elizabeth opening the New Broadgate 1948 (photos taken at a reception at the Council House, Jan 2008). Prof, That photo had to be taken on the Friday afternoon, because a delayed bomb went off across the road in Burton's as they were about to clear this site in the morning, they had just received a message the King would arrive early Saturday. That's a very clear shot of the bomb crater as they were still damping down what was left of the two corner buildings between Broadgate and Martins Bank. 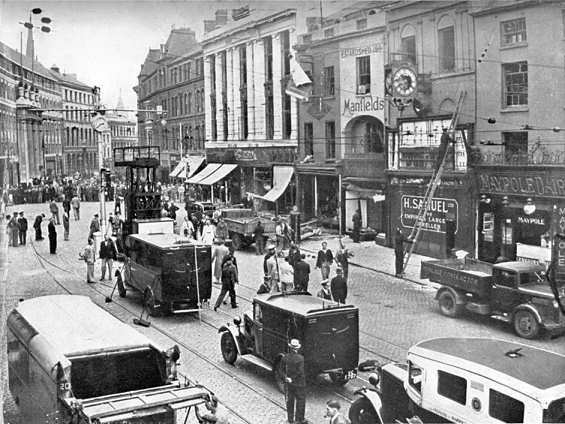 The fire brigade scraped round that corner to get into High Street, as Little and Much Park Streets were still burning furiously on the Friday. After the IRA bomb exploded.